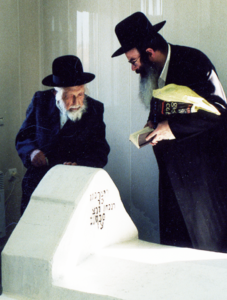 In 1979 the Soviets planned to destroy Rabbi Nachman’s grave in Uman to make way for a housing project. Rabbi Michel Dorfman ז”ל and the leaders of the international Breslov community appointed Rabbi Nasan Maimon as spokesman to avert this threat. Together, Reb Michel and Rav Nasan received encouragement from HaRav Moshe Feinstein זצ”ל and other gedolei Torah. These recordings and their content are © 2011 by Rabbi Nasan Maimon and may not be shared, reproduced, or incorporated in other works, print or digital, without his written permission.